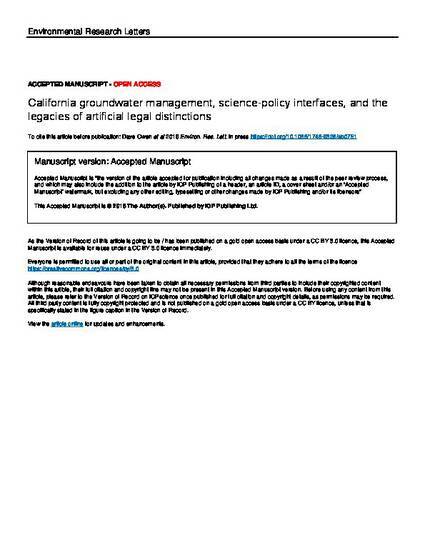 This work is supported by the University of California Office of the President (UCOP) through the UC Water Security and Sustainability Research Initiative (UCOP Grant No. 13941). California water law has traditionally treated groundwater and surface water as separate resources. The 2014 Sustainable Groundwater Management Act (SGMA) broke with this tradition by requiring groundwater managers to avoid significant and unreasonable adverse impacts to beneficial uses of surface water. This paper considers the trajectory of this partial integration of science, law, and resource management policy. Drawing on legal analysis and participatory workshops with subject area experts, we describe the challenges of reconciling the separate legal systems that grew out of an artificial legal distinction between different aspects of the same resource. Our analysis offers two main contributions. First, it demonstrates that laws that subdivide an interconnected resource can have legacy effects that linger long after lawmakers begin dismantling the artificial divides. Using SGMA as a case study, the article illustrates the complexities of reconciling law with science, showing that reconciliation is a process that does not end with updating statutes, or with any other single intervention. Second, we introduce a framework for evaluating the elements of an effort to reconcile law with scientific understanding, whether that reform effort involves groundwater or some other resource. Applying that framework helps reveal where lingering legacy effects still need to be addressed. More generally, it reveals the need for literature addressing science-policy interactions to devote more attention to the multifaceted nature of law and policy reform. Much of that literature describes policy-making in broad and undifferentiated terms, often referring simply to "the science-policy interface." But as the SGMA case study illustrates, the complex and multi-layered nature of policy-making means that a successful reform effort may need to address many science-policy interfaces. This Accepted Manuscript is © 2018 The Author(s). Published by IOP Publishing Ltd.
As the Version of Record of this article is going to be / has been published on a gold open access basis under a CC BY 3.0 licence, this Accepted Manuscript is available for reuse under a CC BY 3.0 licence immediately. Dave Owen et al 2019 Environmental Research Letters. in press.